It was the perfect day for sightseeing, and we took full advantage of it. 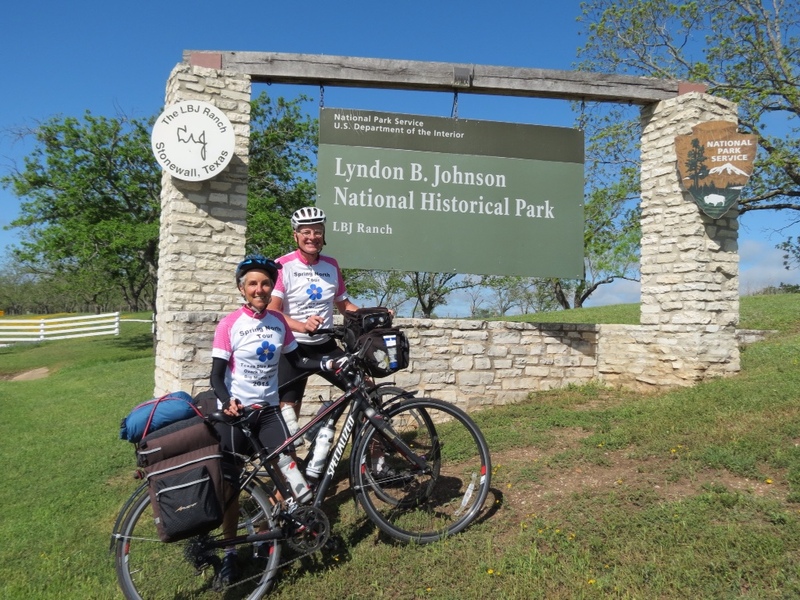 Having only 42 miles to get from Fredericksburg to Johnson City by back roads left us with plenty of time in the middle to explore the LBJ Ranch. Even the ride to the entrance was enjoyable. Following the Pedernales River on Ranch Road 1 through beautiful green grounds, we could see the ranch across the way. With the sun shining down through a perfectly blue sky and temperatures still in the comfortable range, it was idyllic. 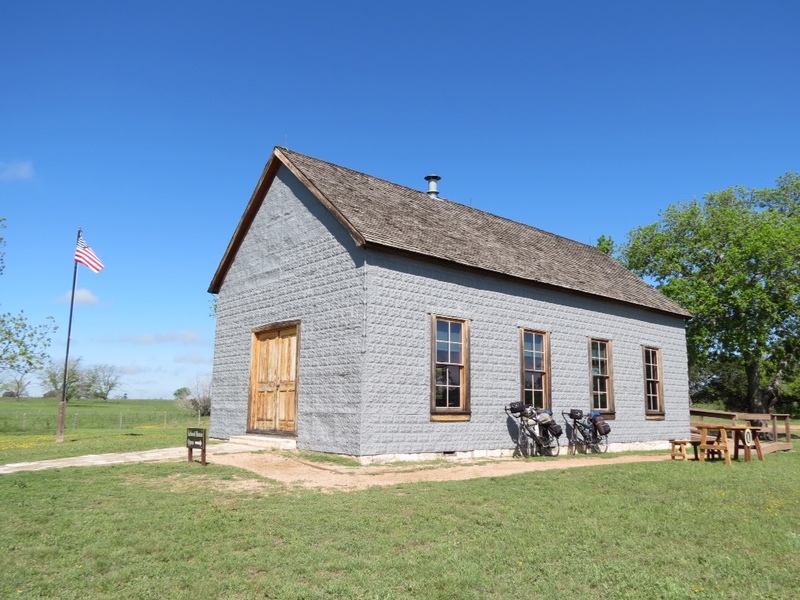 Our first stop was at Junction School, the one-room schoolhouse where LBJ first attended school and later signed the Elementary and Secondary Education Act with his former teacher at his side. From there we wound through the grounds and made our way over to the ranch house. Right outside was the Jetstar plane that LBJ flew from Washington directly to the ranch while President, which he dubbed Airforce One Half since it was so small. Tickets to tour the “Texas White House” were a bargain at $3 and we had a wonderful guide who took us through the house. In addition to describing the rooms, he incorporated insights into LBJ's personality, likes, dislikes and habits. What made it all especially interesting to us was that it was history that was within our own lifetimes, and easily within our range of memory. The furnishings, clothing and accessories in the home were of an era that was entirely familiar. And we could relate it all to a President we remembered. But what gave us the greatest shock was stepping into the dining room. There on the walls was the same mural we had in our home for 26 years! In this case it was wall paper that featured a tranquil domestic scene of a bridge with a village down below and a mountain in the distance, repeated all around the room. In our house, it was a painting done on a single wall by the former owner of the house, which we preserved for all those years. We'd always thought it was an original design, yet it must have been copied from this same wall paper pattern! Little did we know we had this in common with LBJ. We took our time viewing the additional buildings and exhibits before finally moving along. The weather had heated up by then and we arrived in Johnson City very ready for our afternoon DQ cones. Our motel had beautiful grounds which included a very nice small pool. Taking a cool dip after cycling felt heavenly. 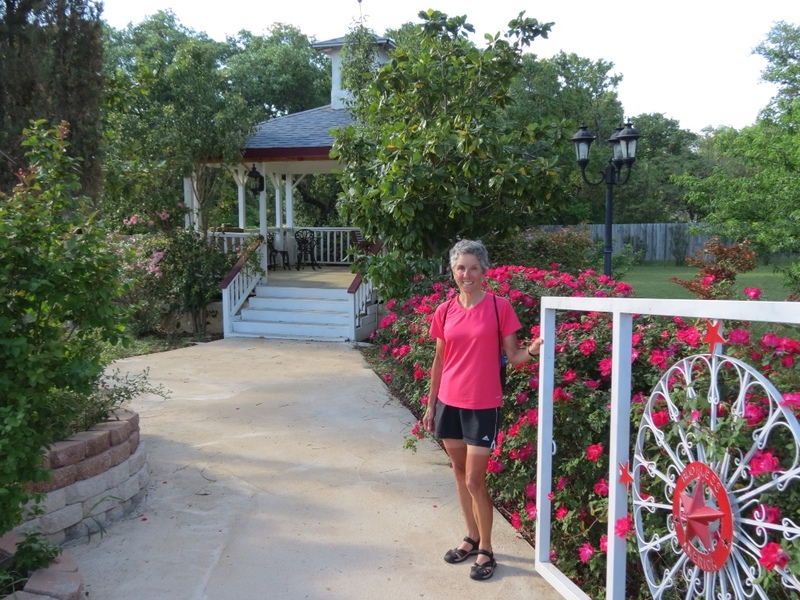 I followed that with hanging out in the lovely gazebo surrounded by roses. It was a wonderful continuation of the day. It was still warm when we walked home from dinner. 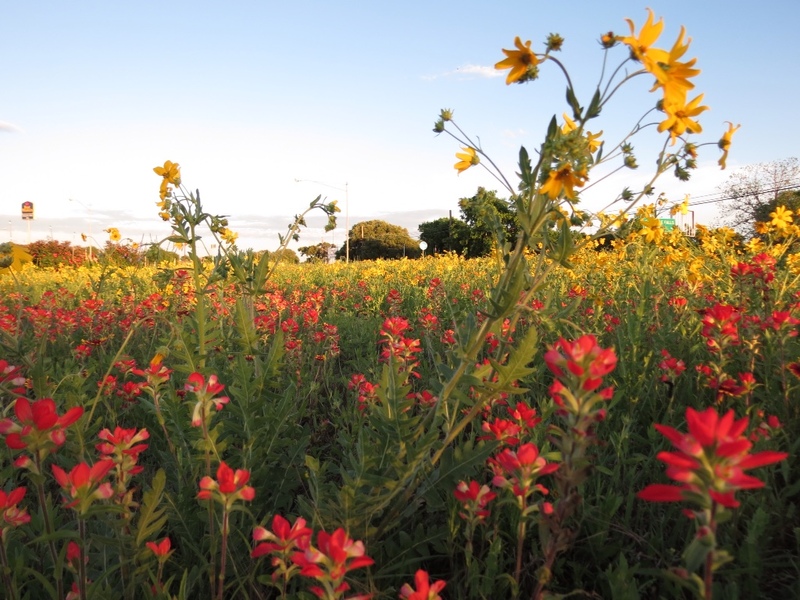 The sun was low in the sky, casting its golden hour glow on a huge expanse of wildflowers. I wasn't alone in stopping to take photos. It appeared to be very popular with the locals. Having learned how much he treasured his ranch land and his love for National Parks, it seemed a fitting finale to our day with LBJ. Yes, LBJ, the man who converted me to the DFL from a Republican tradition!